In 1925, Rinaldo and Ezilda Torre visited family in Lucca, Italy. They returned home to their native San Francisco with very important cargo: handwritten recipes for their now-famous authentic flavored Torani syrups and sauces. The Torani name has become synonymous with a great Italian soda, and was even used to create the world's first flavored latte! 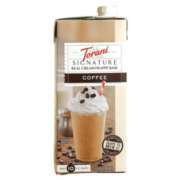 We stock a wide variety of Torani sauces and syrups, including sugar free caramel sauce, chocolate sauce, and others, which we can quickly deliver to you in safe and secure packaging.